Qutub Minar or Qutb Minar is an elegant minaret in New Delhi. It forms the part of the Qutub Complex, a UNESCO World Heritage Site, in Mehrauli area of New Delhi, India. It has been one of the most visited tourist destinations in Delhi and India as well. Every year a large gathering of tourists from all over the world make their visits to the famous Qutub Minar, the tallest brick minaret in India. It is known for its beautiful architecture and at its heights as well. The minaret is 240 feet tall with five storey. Its base diameter is 47 meter. There are a spiral staircase of 379 steps in the Qutub Minar. The construction of soaring minaret was started by Qutub Ud-Din-Aibak, the founder of Delhi Sultanate and finished by his succession and son-in-law Shams Ud-Din Iltutmish. It is believed that its design is inspired with the Minaret of Jam in Afghanistan. This cultural and historical brick minaret is surrounded by several magnificent monuments of the Qutub Complex of historical importance. Quwwat-ul-Islam Mosque, Iron Pillar of Delhi, Smith's Folly, Shams Ud-Din Iltutmish’s Tomb, Ala-Ud-Din Khilji's Tomb, Madrasa, Alai Minar, Smith's Cupola, Alai Darwaza, Tomb of Imam Zamin, Ruins of Jain Temples, and several other ruins of ancient structures are key attractions within Qutub Complex. Exploring Qutub Complex will provide you a wonderful experience to cherish for life time. You will see a large gathering of tourists come here to see the famous Qutub Minar and explore historical monuments around. 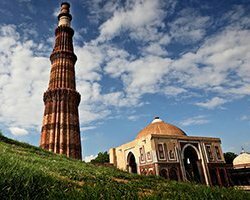 If you are fond of historical monuments and architectures then you should not miss to visit the Qutub Minar Complex on your Delhi sightseeing tour. The stunning architecture of the Qutub Minar and other monuments around will never fail to lure you. Calligraphy on upper base section and decorative motifs on upper levels of the minaret are simply superb and will amaze you. Alai Darwaza & Minar: Alai Darwaza which leads to incomplete Alai Minar. The interior of the Alai Darwaza resembles Timber ornamentation and is simply superb. You will also be amazed to see stunning arch carvings of Alai Darwaza. Iron Pillar of Delhi: The Iron Pillar situated at Qutub Complex is not only a historical attraction to see but is also one of the world’s foremost metallurgical curiosities. The height of the pillar is 7.21 meter, and weight is approx. 6 tones. This historical iron pillar was erected by Chandragupta II Vikramaditya in front of Vishnu Temple Complex in Udaygiri around 402 AD. Later this pillar was shifted from Udaygiri to its current location by Anangpal in 10th century. Iltutmish Tomb: The tomb of Iltutmish within the Qutub Complex is a key attraction. The tomb is known for its ornate carvings and decorated with marble and a rich amalgamation of Hindu motives into Islamic architecture. Quwwat-ul-Islam Mosque: Also known as Qutub Mosque or the Great Mosque of Delhi, the Quwwat-ul-Islam Mosque (Dome of Islam) was constructed by Qutub Ud-Din Aibak, the founder of the Slave Dynasty and Delhi Sultanate. Though the mosque is ruined today but beautiful floral motifs, geometric patterns, and corbelled arches can be seen. There are several other monuments of historical monuments within the Qutub Complex which will amaze you. Explore this world heritage site with your family members or friends to cherish an experience of lifetime.